Want some beading patterns for Christmas? Try one of these simple, step-by-step beading tutorials from The Bead Club Lounge. There’s nothing like a handmade gift for Christmas. Taking the time to craft something with your hands tells the recipient that you really care. Not to mention, they’ll have a one of a kind piece because no two handmade crafts are ever alike. 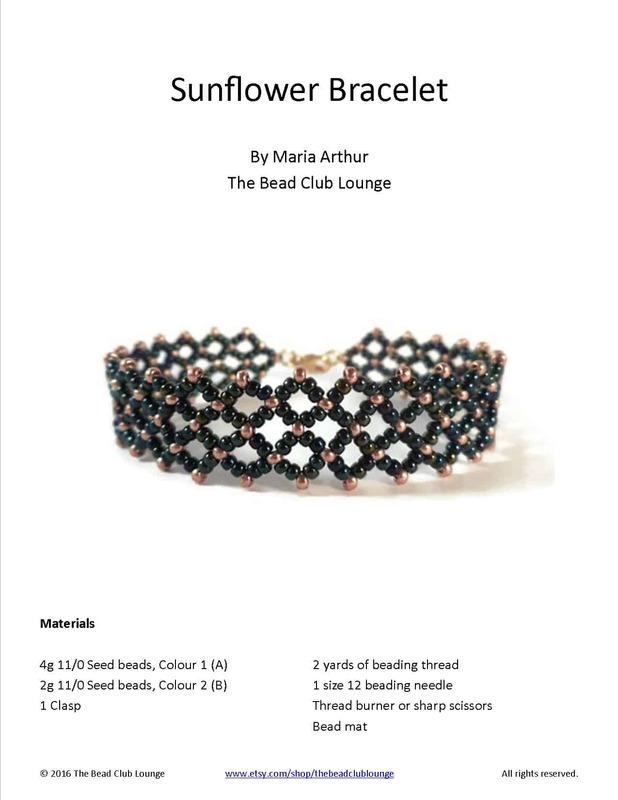 In an effort to help you create thoughtful and unique presents for your friends and family, I thought I’d compile a list of the most popular beading patterns for Christmas from The Bead Club Lounge. All of these detailed tutorials are written in English with step-by-step photos. Do you remember the pinwheel? It was a child’s toy with colorful vanes on a stick that you watched blow in the wind. Ah… simple times. Well, this pattern uses three different colors of SuperDuo beads and they swirl around one another in a way that reminds me of a pinwheel. The Pinwheel Ornament pattern is definitely the most popular Christmas beading pattern in The Bead Club Lounge shop. It’s racked up quite a few 5-star reviews on Etsy too. This tutorial is suitable for all skill levels. Click here to purchase the Pinwheel Ornament Pattern. This is a recent addition to the shop but even so, it has quickly become a favorite. To create this pattern, you’ll use St Petersburg Stitch — a technique that isn’t used often enough, in my humble opinion. You’ll need some seed beads in various sizes, 3mm beads and a bicone for the sweet bow detail. This tutorial is appropriate for all skill levels. Click here to purchase the Christmas Wreath Ornament pattern. You can’t deny that stars are a popular symbol at Christmas time so it’s only appropriate that I add a beaded star tutorial to this list, right? All you’ll need to make these adorable star earrings are 6mm Bugle beads and some seed beads. This Right-Angle Weave tutorial is recommended for intermediate beaders but it’s a pretty simple project so even if you’re a beginner, don’t be afraid of this one. Click here to purchase the Starry Nights Earrings pattern. I don’t get snow where I live so I bring the snow to me through beads. To create the SuperDuo snowflake ornament, you’ll need some SuperDuo beads, as well as, size 11 and 8 seed beads. This is another bead-weaving tutorial that’s great for all skill levels. Click here to purchase the SuperDuo Snowflake Ornament. This Peyote Stitch beading pattern is recommended for intermediate skill levels. It’s a seed bead tutorial and you’ll need two colors of size 11 Delica beads. I love using Delicas for Peyote beading projects because they fit so snugly together. They really make the final piece look good. Click here to purchase the Five-Pointed Star Ornament pattern. Use these ornament patterns to make beaded earrings, pendants or maybe even a fun box topper when wrapping gifts. Give these beading patterns for Christmas a try and shower your friends and family with the gift of your handmade creations this holiday season.